Main Window: All functions are accessed by menu or shortcut key. The status bar at the bottom is used to indicate a change in the virtual keymap. Loaded File Statistics: When loading a file with automatic text coding detection the statistics can be useful to check what kind of file you have. 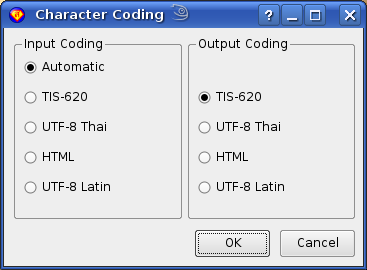 Character Coding: Input coding may be automatically selected, this setting also applies to copy and paste actions. 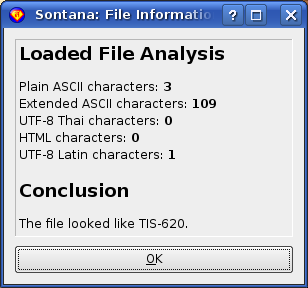 In most cases it is best to UTF-8 for output coding. Sequence Checking: It may come as a surprise to learn that the order in which you type Thai consonants, vowels and diacritical marks is important. If you type in the wrong order this may have repercussions in how text is displayed: it may look correct to you but to a user on another computer it can be displayed wrong, unreadable or even crash their software. 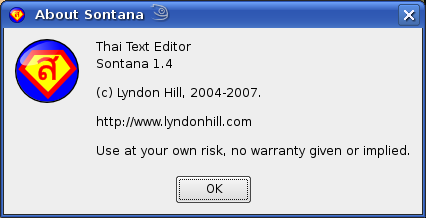 Sontana can filter your typing so that incorrect letter sequence is impossible to enter. Due to copy, paste and the need to allow the user to move the cursor anywhere it is not possible to stop the user creating bad sequences so the Check function can be used to find errors at any time. Text Search: A simple search for the given sample of text. Jump to a Specific Line: Programmers and web page editors will find this function useful. Often, errors detected during compilation or validation are reported with the line number at which they occur. About: Version and copyright information.